Any high technology product with the exception of mp3 players like iPod come with a baggage of useful (less) features each trying to further complicate the problem which the consumer wanted to solve by using it. For example, we buy digital cameras to collect every moment as we live. But we end up getting either blurred pictures or shaken ones or something else. The camera itself (atleast mine, A75 â€“ PowerShot) comes with huge list of features and hundreds of settings. It takes 2-3 operations for anyone to get pissed off with the settings and resort to ‘Auto’ mode for almost everything. (Well, I am talking about amateur photographers here). The point is that, we buy something because we would like to fill some gap somewhere. What if the product/company/service personnel donâ€™t help us in filling that gap? We end up not filling our gaps or worse still, we start recommending others not to buy that product. 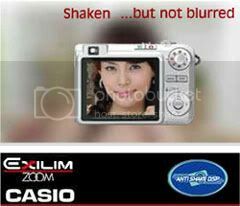 I saw this ad of Casio Digital Camera in ET website. There are a couple of things about it. The company took extra pain to explain you and me what it is all about. The interactive ad helps you identify the gap. Much better than a list of attractive features. Contrast this with a CANON camera ad, which just says you need a camera to capture whatever attracts you. The ad doesnâ€™t tell you why you have to buy only CANON camera. Nor it helps you to fill a particular gap.